The very best microfiber dust mops you can buy, guaranteed. We use long loop, split microfiber for our dust mop so it looks and functions like a traditional cotton dust mop, but by using split microfiber, the Cedar Creek Dust Mop removes 80% more dust than the traditional cotton dust mop. So how is the Cedar Creek Dust Mop different from all other microfiber dust mops on the market? All other microfiber and disposable mops simply push the dust and hair around... it just piles up in front of the mop. On the Cedar Creek Dust mop, the long loops work together with the revolutionary Rocker Frame to create space under the mop for the hair and dust to go, so it becomes trapped and the floor is truly cleaned. The Rocker Frame actually lifts the leading edge of the mop to create a gap so that the dust goes UNDER the mop instead of piling up in front of the mop. With electrostatic action, the Cedar Creek Dust Mop attracts and holds all types of dust and debris, especially pet hair and dander to help reduce allergens in your home. The Cedar Creek Dust Mop can also be used damp and will not stick to the floor. When used damp on a rougher surface floor with the Fluid Bucketless Floor Cleaning System, the Dust Mop's long strands reach into the grout and glides over the rough surface without snagging. This is also the best mop to use for damp mopping Gymnastics Mats and rubber flooring. The Cedar Creek Dust Mop is 18" long and attaches the frame with Velcro style loop material. This is a universal mop that will work on all 16" and 18" Velcro style frames. Hand or machine wash the Dust & Mop to clean and re-use hundreds of times! Be sure to check out the full lineup of Cedar Creek microfiber products on Amazon including the patent-pending Fluid Bucketless Microfiber Mopping System. Can also be used damp with the Cedar Creek Fluid Bucketless Mopping System to clean rough surface and stone floors. The mop does not stick to the floor when wet like other microfiber mops. 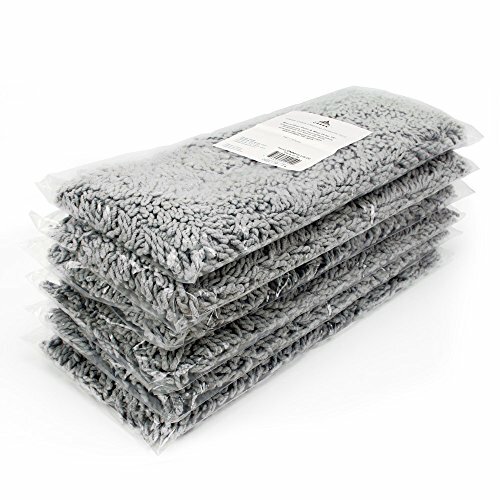 No more filling the landfill with disposable Swiffer mops, these mop pads can be machine washed and re-used hundreds of times. Universal fit for all 34" or 36" Velcro style frames, but works best with Cedar Creek Rocker Frames. If you have any questions about this product by Cedar Creek, contact us by completing and submitting the form below. If you are looking for a specif part number, please include it with your message.